Ringtone of Vedic mantra "Om Sahana Vavatu" for mobile phones. 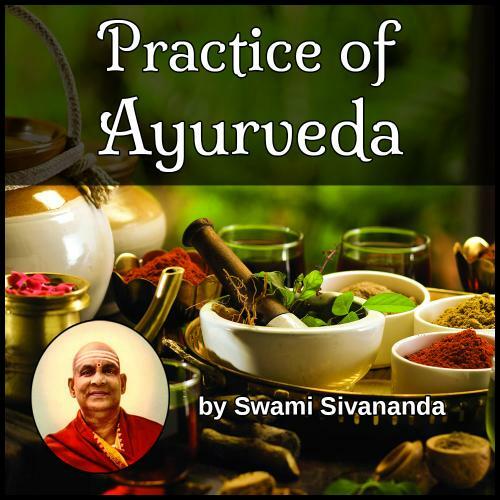 The book "Practice of Ayurveda" by Swami Sivananda in PDF format. Sri Swami Sivanandaji Maharaj was a healer of the body in his Purvashram (before he entered the Holy Order of Sannyasa). He was a born healer, with an extraordinary inborn love to serve humanity; that is why he chose the medical profession as a career. That is why he edited and published a health Journal "Ambrosia". That is why he went over to Malaya to serve the poor in the plantations there. And, strangely enough, that is why, he renounced the world and embraced the Holy Order of Sannyasa. He was a healer of the body and the soul. This truth is reflected in the Ashram which he has established in Rishikesh. The huge hospital equipped with modern instruments was set up and the entire Ashram where all are welcome to get themselves healed of their heart’s sores and thoroughly refresh themselves in the divine atmosphere of the holy place. Sri Swamiji wanted that all systems of healing should flourish. He had equal love and admiration for all systems of healing. He wanted that the best of all the systems should be brought out and utilised in the service of Man. He has written a number of books on all aspects of Healing—from the Naturopathic and Allopathic points of view. This one dealing with Ayurveda is a valuable addition to the healer’s armamentarium. Ayurveda is the Veda or knowledge of Ayus or life. It has been classified as the Fifth Veda. Ayurveda is a distinct Veda. It is even superior to the other Vedas because it gives life which is the basis of all enjoyments, study, meditation and Yoga Sadhana. Ayurveda is the science of life. It shows the way to remove diseases, to keep up sound health and attain longevity. Ayurveda was in vogue in India since very early times. The Ayurvedic and Siddha systems have played a very important and vital part in the sphere of public health. Their popularity is due to their availability, cheapness and efficacy. Here is a beautiful ideal of Charaka: "Not for self, not for the fulfilment of any earthly desire of gain, but solely for the good of suffering humanity should you treat your patients and so excel all. Those who sell the treatment of disease as merchandise gather the dust and neglect the gold." Charaka also says: "A physician who cannot enter into the innermost soul of the patient with the bright light of the lamp of his own knowledge cannot successfully treat any disease." India has ever been evolving art after art, science after science, as her contribution to the common heritage of all the nations of the world. Her greatest gift to the world is the gift of the spiritual science of Self-perfection. Next to it we should place this Science of Life, the Ayurveda, as a precious gift to be carefully developed and broadcast to all nations. It is a national duty of every Indian.